Graham was born in Allegheny City – later to become part of Pittsburgh, Pennsylvania – in 1894. Her father George Graham practiced as what in the Victorian era was known as an "alienist", a practitioner of an early form of psychiatry. The Grahams were strict Presbyterians. Dr. Graham was a third-generation American of Irish descent. Her mother Jane Beers was a second-generation American of Irish, Scots-Irish, and English descent and was also a sixth-generation descendant of Myles Standish. While her parents provided a comfortable environment in her youth, it was not one that encouraged dancing. On April 1, 1958, the Martha Graham Dance Company premiered the ballet Clytemnestra, based on the ancient Greek legend Clytemnestra and it became a huge success and great accomplishment for Graham. With a score by Egyptian-born composer Halim El-Dabh, this ballet was a large scale work and the only full-length work in Graham's career. Graham choreographed and danced the title role, spending almost the entire duration of the performance on the stage. The ballet was based on the Greek mythology of the same title and tells a tale of Queen Clytemnestra who is married to King Agamemnon. Within the ballet, Clytemnestra has an affair with Aegisthus, while her husband is away battling at the Trojan War. Upon Agamemnon's victorious return he discovers his wife has had an affair, and in revenge Agamemnon offers their daughter, Iphigenia to be sacrificed. Later in the ballet, Clytemnestra is murdered by her other child, her son, Orestes, and the audience experiences Clytemnestra in the afterworld. This ballet was deemed a masterpiece of 20th-century American modernism and was so successful it had a limited engagement showing on Broadway. Throughout her career Graham resisted requests for her dances to be recorded because she believed that live performances should only exist on stage as they are experienced. There were a few notable exceptions. For example, in addition to her collaboration with Sunami in the 1920s, she also worked on a limited basis with still photographers Imogen Cunningham in the 1930s, and Barbara Morgan in the 1940s. Graham considered Philippe Halsman's photographs of Dark Meadow the most complete photographic record of any of her dances. Halsman also photographed in the 1940s Letter to the World, Cave of the Heart, Night Journey and Every Soul is a Circus. In later years her thinking on the matter evolved and others convinced her to let them recreate some of what was lost. In 1952 Graham allowed taping of her meeting and cultural exchange with famed deafblind author, activist and lecturer Helen Keller, who, after a visit to one of Graham's company rehearsals became a close friend and supporter. Graham was inspired by Keller's joy from and interpretation of dance, utilizing her body to feel the vibration of drums and sound of feet and movement of the air around her. In her biography Martha, Agnes de Mille cites Graham's last performance as having occurred on the evening of May 25, 1968, in "Time of Snow". But in A Dancer's Life, biographer Russell Freedman lists the year of Graham's final performance as 1969. In her 1991 autobiography, Blood Memory, Graham herself lists her final performance as her 1970 appearance in Cortege of Eagles when she was 76 years old. Graham's choreographies span 181 compositions. 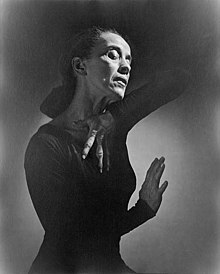 Martha Graham has been said to be the one that brought dance into the 20th century. Due to the work of her assistants, Linda Hodes, Pearl Lang, Diane Gray, Yuriko, and others, much of Graham's work and technique have been preserved. They taped interviews of Graham describing her entire technique and videos of her performances. As Glen Tetley told Agnes de Mille, “The wonderful thing about Martha in her good days was her generosity. So many people stole Martha's unique personal vocabulary, consciously or unconsciously, and performed it in concerts. I have never once heard Martha say, 'So-and-so has used my choreography.'" An entire movement was created by her that revolutionized the dance world and created what is known today as modern dance. Now, dancers all over the world study and perform modern dance. Choreographers and professional dancers look to her for inspiration. ^ a b Bondi (1995) p. 74 quote: "Picasso of Dance [...] Martha Graham was to modern dance what Pablo Picasso was to modern art." ^ Debra Craine; Judith Mackrell (19 August 2010). The Oxford Dictionary of Dance. Oxford University Press. p. 196. ISBN 0-19-956344-6. ^ Marthagraham.org Archived January 10, 2010, at the Wayback Machine. ^ Moving force, Haaretz Archived February 25, 2012, at the Wayback Machine.